LOUISA, KY. — After a disappointing 8-22 season last year Lawrence Co. Boys basketball is looking for a big bounce back season in 2018/19. The Bulldogs only lost one player off of last year’s team and Head Coach Travis York is very optimistic about the season. Lawrence Co. lost nine games last season that were decided by three possessions or less. The team went to work right after losing in the first round of the District tournament to Floyd Central. This Bulldog team will be more physical this season which will help close out games. 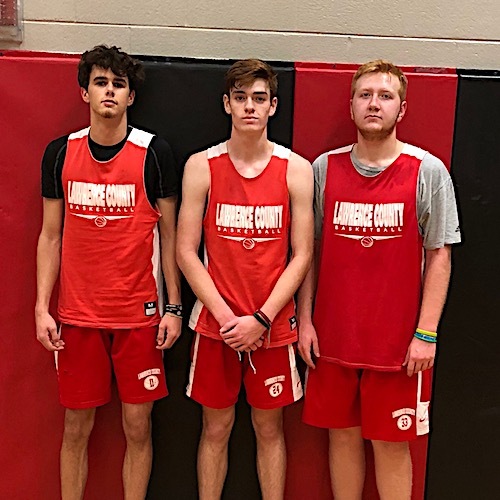 The Dawgs return a ton of experience from last season led by Junior Tyler Maynard 16 points per game, Freshman Cody Maynard 14 points per game, Seniors Lucas Maynard and Noah Fairchild at 6 points apiece along with Junior Chase Sartin at 8 points per game, Sophomore Baden Gillispie at 5 points per game and Junior Alex Ratliff 6 points per game. Sophomore CJ Fairchild and Freshman Bryce Blevins stars on the baseball diamond along with Tyler Maynard should help out this years squad. Senior Eric Webb and Freshman Trenton Adkins should also contribute. The Dawgs will play another rough schedule with games in the Rebel shootout against Tolsia and either Johnson Central/Huntington. They will also participate in the first ever Class 2A tournament at Magoffin Co. in January along with the 58th District games against Floyd Central, Betsy Layne and Prestonsburg. They will also host the District tournament this year. The Bulldogs will open the season at home Tuesday vs East Carter and then travel to Morgan Co. on Wednesday and Jenkins on Saturday. Senior Noah West has left the team.